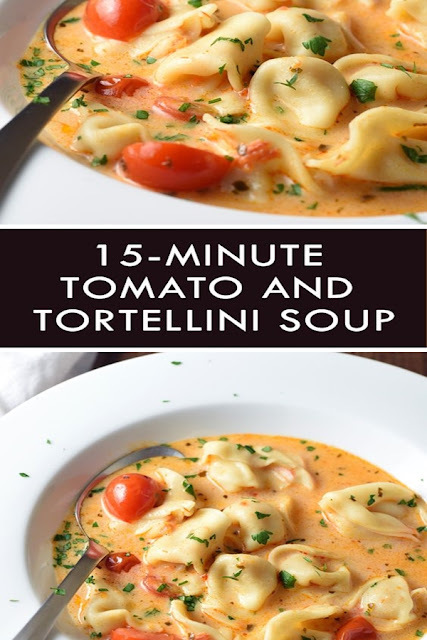 Super easy Tomato Tortellini Soup that’s ready in only 15 minutes! Such a lifesaver during those busy weeknights and holiday time! I used to be so organized, you guys. Mail opened the same day it arrives, bills paid weeks before they were due, laundry folded immediately (can you even imagine?! ), holiday cards made and printed in early November, and gifts purchased and wrapped by December 1st. None of that is happening anymore. I mean, not even close. It’s just a hot mess over here. I swear, once your kids hit 3rd grade, play time is o-ver. And don’t even talk to me about 5th grade. But I’m holding onto dinnertime with a vengeance, fighting every urge to have Paul get something on his way home from work every night. This soup certainly isn’t going to win any James Beard awards. But it’s simple, and fast, and delicious, and I’ve made it four times in the last two weeks. A total lifesaver this month! Add in the tortellini; reduce heat to a simmer and cook for 7 minutes until pasta is almost tender. Add in tomatoes and continue to cook for another 1-2 minutes until tomatoes have softened. Stir in the pesto and cream. Taste and adjust with a little bit of salt and pepper, if necessary. And a pinch of cracked red pepper flakes for a little kick, if desired. Ladle into bowls and sprinkle with some fresh parsley. Traditional basil pesto can be substituted for the sun-dried tomato, which is also delicious! Vegetable broth can be substituted for the chicken broth for a vegetarian soup.